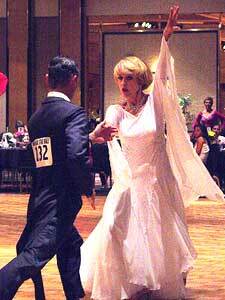 Something very unexpected and powerful took over the night I witnessed my first live ballroom dance competition. It was the Nevada Star Ball, In Las Vegas, in 2001. As a spectator who had been dancing ‘forever’ as a student, professional, teacher and choreographer, I found myself feeling curiously excited over the action taking place before me. What was this energy emanating from these dancers? How can they combine such sweep and speed with such serenity? I watched intently. And before long I was simply bowled over…and hooked. I was watching something that grabbed my dancer’s soul and, (little did I know then) would eventually take over my passion, my time, and a good chunk of my bank account. On that night, I had no intention of reentering the dance world. My husband Bob, and I had retired to Las Vegas after living overseas for thirty-five years, twelve of them in Dhahran with Aramco, where I taught dance to adults and children, choreographed many musical productions for Dhahran Theatre Group and produced the 1985-1992 series of 5678 song and dance productions (which are still performing!) My single exposure to live ballroom dance was watching Sol Asekun and Sylvia Bertie light up the stage with their beautiful numbers in 5678 shows…to enthusiastic applause. But on that warm evening in August at the Stardust, involved with new challenges and activities, my focus and direction veered in the space of a quickstep…I was watching something I had to try and I couldn’t wait to find out how to get started. Somehow, I sensed that ballroom was going to lift my soul, challenge me physically and mentally, and make me realize that being judged on the dance floor would be the ultimate expose of self. 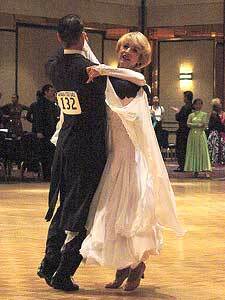 I had found competitive ballroom dance. It didn’t take long to realize that the competitive side of ballroom dance is not a pastime, hobby, exercise venue or social outlet; it is a full-fledged commitment to detail, design and diligence. It’s hard. Hard physically, mentally, and artistically. It’s countless hours of sweat spent in the attempt to get every nuance and step embedded in into body, soul, and muscle memory. It’s hearing over and over the commands to ‘extend’, ‘reach’, ‘lift’, ‘lean’, ‘stretch’, ‘bend’, ‘connect’, and in my case, ‘let me lead’. The diaphanous gown that bedazzles and sparkles, the false eyelashes and makeup, the smooth elegance and ‘light as a feather’ footsteps skimming across the floor first enter life as a clutching, sweaty palm held by a patient instructor. And so it begins. With years of a dance background I began lessons with confidence, determination, and a full expectation of success. Enter reality. My teacher, Aaron Gilliland, quickly won my loyalty and devotion (and admiration) for his ability to lead me forward, yet make me realize that I would have to begin on the bottom rung. This was a technique that was unique, not found in any of the dance disciplines in my repertoire of tap, ballet and jazz. As I watched (and envied) other experienced dancers meld their bodies into the correct positions easily, I knew I had everything to learn. So the process of training muscles, reactions and reflexes began to be programmed. And now I realize it is an on going process that will never cease. Therein lies the challenge, and fuels the determination. As my lessons continued, progress was made, friendships blossomed, and I became ever more impressed with the intricate nature and difficulty of ballroom. Constant inspiration came from Aaron, my beautiful coach Josie Lopez, and my talented colleagues who shared their dance wisdom with me. I discovered there are many people who influence your competitive performance as well as provide a cushion of support when you’re out there surrounded by judges holding a clipboard. It doesn’t take them long to score you, and you get just one chance to make a good first impression. Scary stuff. Moral support is welcome. 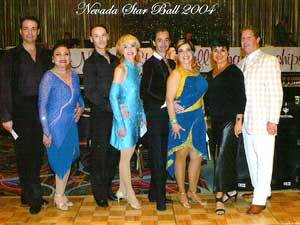 One year after starting lessons, I entered the Nevada Star Ball. The thrill of dancing on the same floor as those dancers I first saw the year before, was unbelievable. It was all brand new. I had no expectations and no preconceived ideas of how I would feel, or how it was judged or conducted. Feeling nothing but excitement, Aaron gallantly let me out to take my first competitive steps in Newcomer Bronze and Bronze I. It was the same year I qualified for Medicare. I took 14 first places. My competitive category is now Silver and although there is a lot of work to be done, I intend to reach Gold before my shelf life reaches the expiry date. I’m comfortable and accepting of the patience it takes to move forward, my competitive spirit is still bright, and I love the sparkly outfits. Please contact Nancy at the above website or email: [email protected]. And of course the cast, crew and loyal fans are urged to attend the next 5678 reunion in 2005. Just send me a note to get in touch and on our mailing list. You’ll love being a part of it!